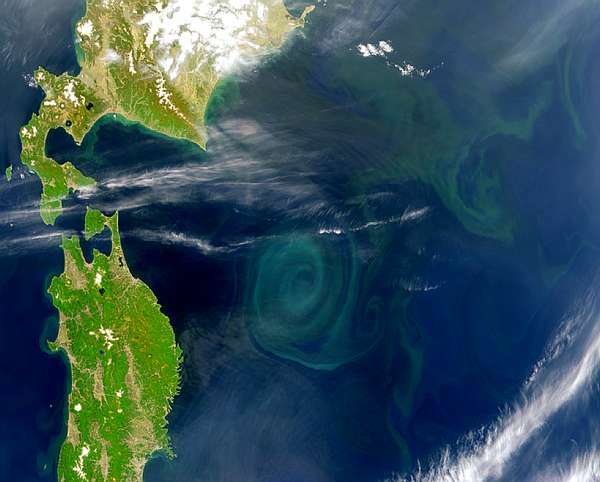 The image above is a photograph taken from space of a gyre off the coast of Japan. The green swirl is actually quite brown; it is the collection of some of humanity’s most indestructible rubbish – plastic. There are about 5 gyres of this type in the world’s oceans, ranging from the size of Texas to the size of Africa. A little over half a century ago, scientists came up with a brilliant idea, a new material that would have one of the biggest influences on all aspects of modern society. From toys, to food wrap, to beauty products, to clothing, plastic has provided a cheaper, more durable alternative. It has fueled the economies of the Asia Pacific coast, and is now helping India and Kenya, who are each producing thousands of tons of plastic bags each month. Plastic has also become on of man’s most lasting impressions on the earth. We bury most of our waste in landfills. This is not a very effective disposal, as polymers, among other materials, have a slowed degradation when they are not exposed to the sun, but rather kept in a cool, dry place. However, we are able to have better control over our garbage when we quarantine it away from sensitive life forms and plant shrubbery over it, creating somewhat of a carbon neutralizing effect. Created in a garage laboratory in Yonkers, NY around the time of World War II, plastic is a combination of carbon and hydrogen. Around the time of the discovery, scientists everywhere began playing with long hydrocarbon molecular chains. Adjustments in these chains affected the durability, functionality, and aesthetics of this material. It was around the same time that plastics began to replace other materials, first in the war and subsequently for commercial use; preserving food, replacing more expensive materials such as metals in toys and other products, and providing for flexible, cheaper clothing material. There are two huge problems that became immediately apparent to the world. The first is the durability of this material. Except for a tiny amount of plastic that has been incinerated, the vast majority of all plastic produced in the past 60 years is still somewhere in our environment. The substance is very difficult to decompose, but when this does occur, the material breaks down into small particles, comparable to grains of sand. These particles are carried by winds to the ocean, and are eventually mistaken for food by birds and jellyfish, which end up dying because the plastic blocks their digestive tracts. To put this point in perspective, we have to consider the world’s lowest (and therefore most important) step in the food pyramid, plankton. While plankton is abundant and is eaten by many different creatures (which are subsequently eaten by larger ones and eventually humans), there is currently six times as much plastic in the ocean as there is plankton. When organisms confuse the two (an increasing instance, as the polymers continue breaking down into pellets), it is of a direct detriment to humans. The second huge problem that plastic poses lies in its composition. As a substance built from hydrogen and carbon, it will eventually (over the course of tens of thousands of years) break down into oxygen, water, and carbon dioxide. In a way, by creating plastic, we are ensuring that even if humans die out, carbon will continue to slowly and uniformly be released into the atmosphere. While this second problem may seem slightly less of an immediate consequence, we have to consider the sheer size of plastic on this planet and the fact that we are continuously creating more, without reusing or scrapping our old waste. Going back to the first setback, we have to realize that as it stands right now, most of our oceans are tainted with the substance and we have to start thinking of alternatives. Researcher and founder of Algita Marine Research Foundation, Charles Moore, has been driven to study plastics and believes that the material is currently the most common surface feature of the world’s oceans. There are, however, ways around every problem and this one is no exception. I am currently looking into plastic alternatives. Stay tuned to learn of ways to avoid plastics.